I promised Angie that I would post how my first Kew sock was doing and here we are. It's grown a bit since I look this photo, but I think it gives a good idea of how things are shaping up. I am doing fewer pattern repeats than the pattern calls for because I like a shorter sock. I think if I was really following the pattern, they would be too tall/long and look odd on me because I'm not very tall. See, Jen! I'm still in the Kew love with you. Even if I can't be faithful to a sock. Btw, did ya'll go read JenLa yesterday? If you haven't, you really should... and I'm not just saying that because I'm afraid of OmaLa. Thank yous to everyone who encouraged me to just shut up and knit fraternal socks. I cast on for sock #2 last night and love how it's going so far. Maybe this will help tame my control freak ways. 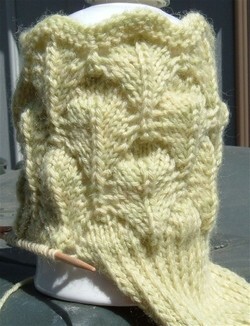 The stress knitting continues, so there should be something to show soonish. Oh you silly goose, it's not my birthday TODAY! Ooh, how did that sock pattern escape me? Very pretty! I am looking forward to seeing that on. The one in Knitty looks almost TOO lacy to me. Kew looks absolutely marvelous! Thanks for the photo. I love seeing the socks but I hope the stress goes out the window, okay? It's not my birthday either silly! Oh, that sock looks nice. Maybe after I finish the breeze. Cause I'm don't cheat on my socks. :) Most of the time. At least with all of those socks you have something to do while listening to Chrisian trance music? I'm still looking for substitute yarn, but I got enough done on the first version that I think the toe-up is gonna work. Love the Kew socks - beautiful.